Some Dinosaur eggshell is found in quite large amounts. Dinos such as Hadrosaur and Oviraptor are fairly common - though with a new ban on Chinese exports Oviraptor shell is becoming scarce. This is a more rare fossil to find and this is the first I have ever offered on this site. A good opportunity for you to add a beautiful and rare fossil to your collection. 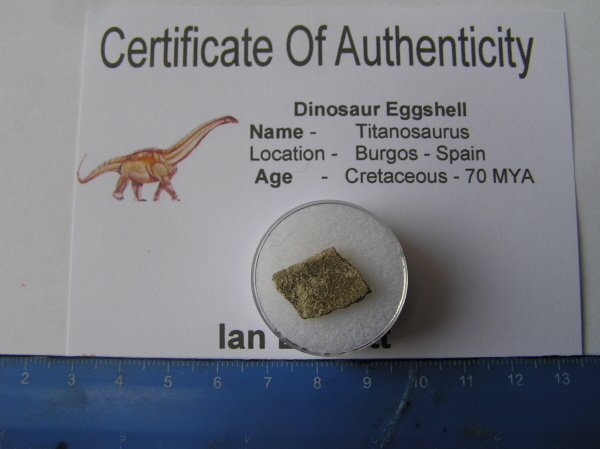 I have sourced this - along with several other types of Dinosaur Eggshell from a specialist collector in France. You will receive the exact pictured piece of eggshell in a padded, plastic box. The piece of shell measures 1.7cm across. The shell comes professionally boxed and labelled and complete with a signed certificate of authenticity - complete with a holographic serial number.